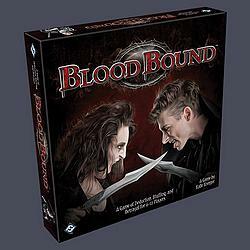 Blood Bound is a game of deduction, bluffing, and betrayal for six to twelve players. Each player belongs to one of two rival vampire clans, and fellow clan members must work together to capture the opposing clan's leader. The catch? Identities are hidden at the start of the game, disguising ally and enemy alike. By attacking other players and forcing them to reveal information about their identity, players must distinguish friend from foe, and root out the rival leader!